Have you heard of the LPC800-MAX? 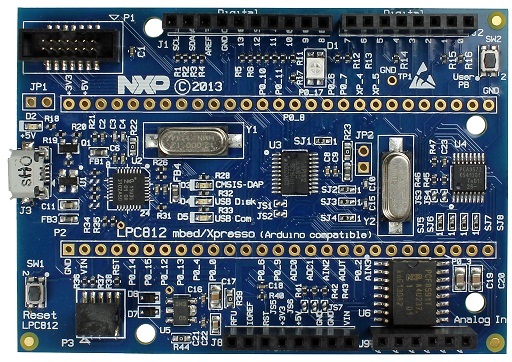 Arduino shield-compatible, mbed-enabled, and LPCXpresso pin-compatible one one board. Costs about US$20. It's pin-compatible with LPCXpresso and Arduino boards. Arduino Uno and LPC800-MAX have usb-enabled MCUs as serial bridges. It's not hard to see the reason for the vitriol from Olimex. The use of external ADC and I/O expansion ICs is a baffling kludge--if the goal was to build an Arduino competitor. Why not use a much faster LPC with more memory and flash and with all the requisite pins and peripherals? I suspect the board exists to sell the LPC812 as an 8-bit killer. The mbed support in particular makes it tempting to get one since I am quite familiar and happy with mbed. I don't know if the expansion ICs operate transparently but if not it'd be a bit cumbersome to use. So, would you buy one? Is NXP nuts? It's the latest craze, everyone is trying to make an Arduino compatible board. Look at boards from Intel, etc. What makes Arduino good is it lowers the entry point to micro development, but when you go beyond it people are in for a big shock. Embedded development is HARD!